Sometimes you find a recipe that’s just too good to mess with. My old peanut butter cookie recipe always seemed to dry out after just a day or two so when I recently had a craving for pb cookies I tested out the version from America’s Test Kitchen and found a new fave. My inlaws got me hooked on America’s Test Kitchen‘s very reliable cookbooks and TV program awhile ago. ATK (as the inlaws call it) is a test kitchen that literally tests popular recipes hundreds of ways with real taste testers to find the absolute best version. It’s really no wonder that their peanut butter cookies are perfectly soft and chewy…plus they unbelievably stayed that way for almost a week! I did decide to mix it up and throw in some extra M&Ms I had laying around into half the batter. Chocolate chips or Reese’s pieces would be tasty too. Preheat oven to 350. Place parchment paper on a baking sheet and set aside. In a medium bowl, whisk together flour, baking soda, baking powder and salt. Set aside. In a large bowl, beat together butter and sugars until fluffy. Beat in peanut butter until well-combined. Add vanilla extract and beat. Beat in eggs one at a time. Gradually beat in dry mixture, scraping down edges of bowl to incorporate throughout the dough. Use a small food processor to finely chop peanuts. Mix in 2/3 of peanuts into the dough until they are evenly dispersed. If using M&Ms or chocolate chips, fold in candy until evenly dispersed. Top cookies with remaining chopped nuts or candy. Use a cookie scoop to scoop dough onto baking sheet. Bake for 10-12 minutes. I love Test Kitchen! I got their huge cookbook for Christmas and have made a few dishes from it…a great resource! 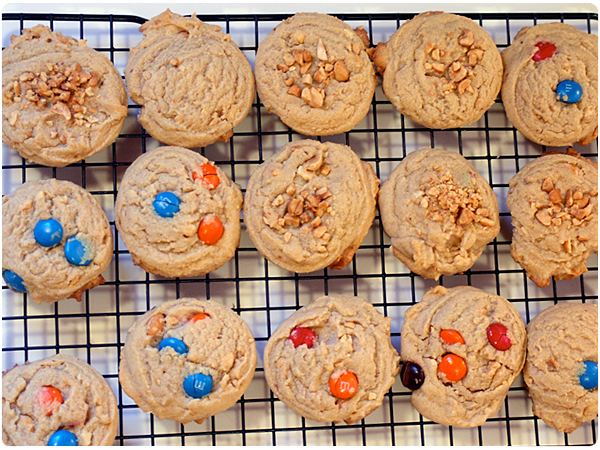 I bet you could modify the recipe and use your PB cookie recipe instead of the Choc Chip. It’d give it a nice Reese’s Peanut Butter taste! Wow I want these now! Definitely saving this recipe- they look great! How many cookies does the recipe make? They looks delicious! I’ll have to try them. I also enjoy ATK and Cook’s Illustrated magazine. You need to try the Cook’s Illustrated Chocolate Chip cookie recipe. It’s UNBELIEVABLE! @Rebecca – It made 4-5 dozen using a small cookie scoop. Quite a lot! @Katie – Not enough in my humble opinion! been doing research on PB cookies for about an hour now. this recipe is EXACTLY the same as 200 other recipes i have seen. In fact i have only found 3 versions of PB cookies. This one, the one with no flour (just PB, egg, sugar, vanilla) and sweetened condensed milk and bisquick. So, really, nothin different here. @Dave – Interesting. The old one I had had Karo syrup in it, so it sounds like there’s a fourth out there. This one was just “new to me” and produced great results for me so I wanted to share! Yes, most cookies (of any variety) have the same ingredients. If you REALLY look at the recipes though the measurements of a particular ingredient will vary widely. What makes these particular cookies so good is the high amount of brown sugar vs white and the wet to dry ratio. I find it very sad how rude some people can be! Try *this* recipe as written and tell me again it’s the same as a recipe with only a 1-2 ratio of brown to white sugar or one egg, etc! dave, get over yourself. If you really want a different version of these cookies invent it yourself. these cookis are AMAZING! Just made these for my son. So delish, thanks ladies! These are really good! I made some earlier today….let me tell you I thought they wouldn’t be so good! My was I wrong??! I made half of the recipie I nearly finished them. Now im putting them to the test….I want to take the rest to school on monday. Lets see if there still fresh! @amy – good to know! I know all ovens are a little different so it can be hard to gauge. I always put down what works for my oven. Maybe next time try testing one sheet and then adjusting the time for the rest. Glad you liked them though! I made these PB cookies a few weeks ago to bring with me to share on a girls weekend with my friends and they were a HUGE hit! Everyone raved about them. Thanks for the great recipe. Can’t go wrong with Cooks Illustrated! I just made these and they are WONDERFUL! I have been looking for a recipe like this for years! I was about to go start experimenting and figured I would do a quick google search, and the pictures did all of the convincing! Thank you so, so, so, much! Yay! So glad you like them. They are definitely my go-to PB recipe! I made them without the chopped roasted peanuts (because I didn’t have any) and I wasn’t impressed. Too much vanilla I think. It was hard to taste the peanut butter (I like my pb cookies to taste like pb and nothing else). They weren’t very chewy either. I’ll try it again another day (after I can get to the store for the peanuts), but I’m not too hopeful. 😦 Still searching for the perfect chewy pb cookie. Try them again, these cookies ARE perfect! I made them for a girls weekend and they were gobbled up (by 30+ year old women). Mine tasted like peanut butter and nothing else and were chewy. One of my friends liked them so much she made them for a wedding shower she hosted. They were a hit there too. I made them another time with m&m’s…also delicious. Anything from ATK is bound to be perfect. @Angel – oh bummer! For me they taste really pb-y and what I really love is that they stay soft (chewy) for multiple days where I’ve found other recipes to get dried out quickly. Maybe try cutting down on the vanilla next time too to suite your tastes. Good luck! 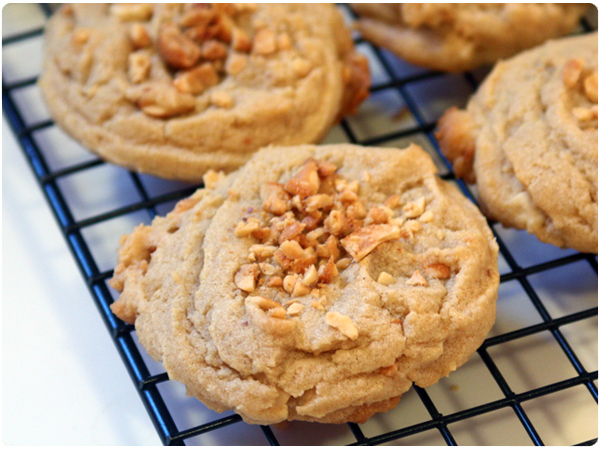 OMG… These are the best PB cookies!! Just made a batch tonight and everyone is raving about them! Thanks for the perfect recipe….this will stay in my favorite cooked book. LOL!! OMG that cracked me up!! You are too funny!!!!! Holy crap, these are PERFECT. I just ate one fresh out of the oven and died. I’m writing this from heaven because these cookies killed me with their perfection. just made these… they are GREAT!! thanks for sharing! 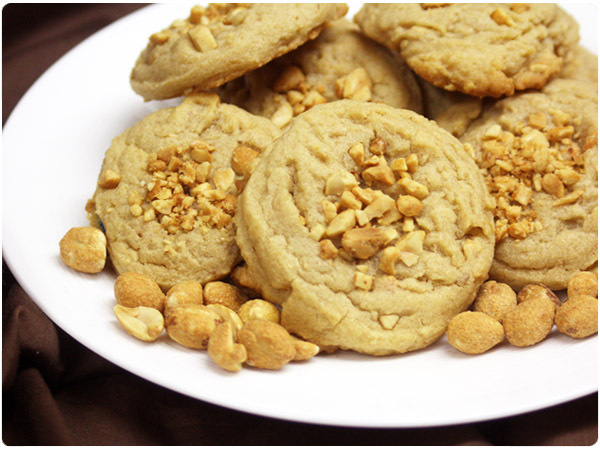 These are the best peanut butter cookies I have ever made. Thanks for sharing!